The one, two punches by Hurricane Irma and Maria of September 2017 has forced many Caribbean islands into a rebuilding and rebirthing process to sustain their tourism industry. The Caribbean Hotel and Tourism Association (CHTA) states that of the 129-member hotels in Anguilla, the British Virgin Islands, Puerto Rico, and the U.S. Virgin Islands that half have re-opened; while the other half are still yet to open. Many of the hotels that are yet to open plan to re-open between September and December of 2018. Some of these properties remain closed to house locals and relief workers. Regardless, hotel and resort re-openings are a positive sign of progress, and it could mean a great vacation without the crowds. When you visit some areas of Anguilla, you may never know a hurricane passed through because of the advanced recovery efforts. The Tourism officials said that 500 rooms were to come back online by April 2018. With a few more coming back online this winter. Travel Weekly Reports (as of March 2018): Two new five-star properties have opened up which are the Quintessence hotel, which opened January 1, and Zemi Beach House, which reopened February 15, including the Four Seasons Resort and Residences on March 23 and The Reef by Cuisinart on April 1. Properties that are opening this November 2018 are the Malliouhana, Cuisinart Golf Resort & Spa and the new Belmond Cap Juluca. There are no re-opening dates for Anacaona Boutique Hotel nor the Anguilla Great House Beach Resort. The residents of Anguilla have bounced back too! They have a positive outlook for 2018. They have worked hard to help their island recover and have worked closely with the United Kingdom using donations from around the world. So, the recovery efforts have moved along quickly. The Anguillans have an indomitable spirit and a “can-do” attitude. Once you land in Anguilla, you will feel the joyous spirit and welcoming vibe. For more information about Anguilla, we encourage you to visit www.Ivisitanguilla.com. Hurricane Irma destroyed about 85% of the buildings in the British Virgin Islands (BVI). The islands top earner and major employer come from tourism which directly or indirectly supports over 80% of the jobs and contributes 96% of the GDP according to the World Tourism & Travel Council. The beaches are still gorgeous. Most of the beach except for Tortola’s Cane Garden Bay are open and accessible. The most exciting thing is that while they are still beautiful, they are not crowded. So, you can find the perfect locations to sunbathe on a stretch of beach. BVI’s special events taking place in 2018 include the PainKiller Cup, a 14-mile stand-up paddleboard race (held in January). The BVI Spring Regatta (held March 26 to April 1). The Inaugural full moon Regatta is a new event that took place on March 27 and held at night under a full moon. A full moon happens every 3 years. And the 2018 BVI Food Fete, which is a month-long series of culinary events on various islands that will take place in the fall. Travel Weekly Reports (As of March 2018): There are close to 400 guest rooms available and some of the charter yachts have returned. This rebuilding effort will continue into 2019. “Anegada Beach Club” reopened on February 1. Cooper Island will reopen March 1 while Oil Nut Bay will have a partial property reopening on the same date. Guana Island will reopen in July; Scrub Island Resort & Spa will reopen on a limited basis this spring with selected accommodations and reduced dining outlets with a full reopening slated for July. The airport is open, and the locals are more than happy to welcome you back to the Island. They have been through a lot over the last year, but they have been resilient. By visiting the Island, you will help boost BVI’s economy, which will also assist with their progress toward full recovery. This is the perfect time to return before the crowds come back. If you pay attention to the news, it will not inspire you to book your next vacation to Puerto Rico. But you should consider it. Why? Most of what you hear on the news are the parts of this island that were heavily hit by Hurricane Maria. There are many parts of the island that have made tremendous progress and are ready to welcome you back to this beautiful island. If you were to drive around the main road and visit the beaches, you would see something entirely different from what you see on the news. Travel Weekly Reports (As of March 2018): “About 80% of the Puerto Rican Tourism endorsed hotels along with may Airbnb and small, family-run inns are open.” In addition, the Wyndham Grand Rio Mar Puerto Rico Golf & Beach Resort reopens on March 1. El San Juan Hotel-Curio Collection by Hilton on Oct 1. Caribe Hilton and Condado Lagoon Villas on July 1, Cofresi Beach Resort in Cabo Rojo on March 15, Comfort Inn San Juan on May 1, Dorado Beach Ritz-Carlton Reserve on October 1, El Canario by the Lagoon on June 18, and El Conquistador Waldorf Astoria and Las Casitas Village on August 31. The new Serafina Beach Hotel opens in San Juan on March 20. Embassy Suites Dorado del Mar Beach & Golf Resort, and Embassy Suites Hotel & Casino in San Juan will reopen in April. Holiday Inn Express San Juan Condado on June 1, Hotel St. Regis Bahia Beach on August 31, Melia Coco Beach Puerto Rico on November 1, Condado Plaza Hilton on July 1, Verdanza Hotel on April 1, and W Retreat & Spa in Vieques on December 31. The Ritz-Carlton San Juan is not accepting reservations at this time. Like many of the other Caribbean islands that were devastated by Hurricane Irma and Maria, the local tourism officials want you to know that your travel dollars are a blessing to Puerto Rico during this difficult time. By booking your next vacation, you will help families keep their jobs while supporting them at the same time. Traveling to Puerto Rico makes a difference and will be a vacation experience that you can feel good about. Despite the fact that the scars from the Hurricane remain, the sparkling beauty of the US Virgin Islands is on the rebound. Many of the beaches have been cleared of debris, and the Caribbean Sea remains the bright blue as always. Since tourist accounts for a huge part of the economy in the USVI, the Islanders are looking forward to tourist returning soon. Travel Weekly Reports (as of March 2018): About 40% of the hotels are operational. Two of St. Croix’s largest hotels that will be closed, for the most part, through 2018 is the Divi Carina Bay All-Inclusive Resort & Casino on the east end and the 150-room Renaissance St. Croix Carambola Beach Resort & Spa. There is no re-open date for the Renaissance St. Croix Carambola Beach Resort & Spa. The Caravelle Hotel & Casino has been used to assist relief workers. This hotel will close on April 30th for repairs and is scheduled to reopen September 1, 2018. At St. Thomas and St. John, there are about 9,000 rooms available at villas, apartments, inns, Charter yachts, and Airbnb type properties. Many of the hotels are closed for repairs and renovations. “Marriott's Frenchman's Cove in St. Thomas reopened on Feb 16, while Frenchman's Reef & Morning Star Marriott Beach Resort remains closed until further notice as do Sugar Bay Resort & Spa and the Ritz-Carlton St. Thomas. Bolongo Bay Beach Resort will reopen in June.” Also the Westin John Resort & Villa, Caneel Bay and Concordia Eco-Resort on St. John do not have re-open dates at this time. According to DENVER NICKS, if you hate crowds but have a desire to visit a tropical paradise without a passport, the now is the right time to visit the US Virgin Islands. Nicks says “the hills are becoming green again, after that one, two punch by Hurricanes Irma and Maria in 2017. Those winds stripped many of the Caribbean islands of their natural beauty as if a forest fire had devasted them. So this comeback is quite astonishing when you consider the NASA photos shown below. However, Nicks noted that the wet months are helping the palm trees and foliage sprout new growth. If you are a bold and fearless traveler, then you may not mind a few discomforts in exchange for an uncrowded vacation to the islands hit hard by Hurricanes Irma and Maria. All the islands are making a compact at their own pace. This is a special time for them as they give rebirth to tourism through renewal and creativity. If you are looking for an authentic experience that is deeper freer and more fun than any other vacation that you’ve had in the past, then it’s time to book your next vacation to one of the islands mentioned above. Residents from each of these islands have a bright and positive outlook and welcome you with open arms. 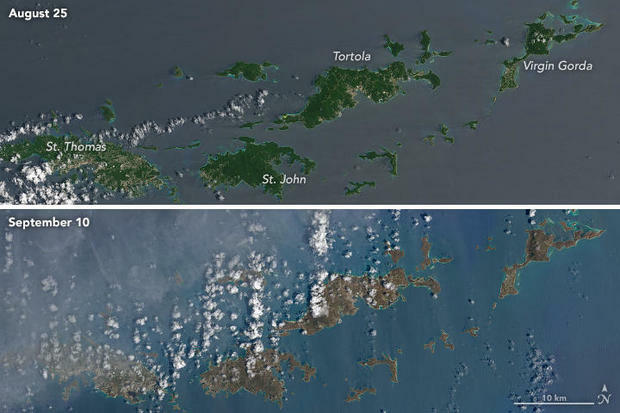 To see a more comprehensive list of all the hurricane-stricken islands read more by clicking here! Want to book your next vacation? Then visit our DIY booking site by clicking here. Or if you prefer to receive a customized experience for a small fee of $100 (added in with your invoice), then you can contact AJ Clonts at 1-844-748-9474 or Sharon Pearson at 440-925-5568, and we will be glad to be of assistance to you. Your vacation consultation is available to you at no extra charge.